There are currently 3,572 users on this website. Following the indications of LB and James, I open this new topic on Catalan cinderellas, as Barcelona is just the capital of Catalonia, although the city is more known than the country. 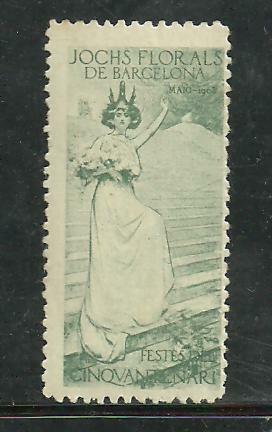 I will start by showing some early 20th century cinderellas, issued in 1913 to advertize a fair, "Import/Export Fair", which actually was never celebrated. As we'll see, this is not the only time when this had happened. These labels were designed by L. Mizen and printed by "Reproductions Reclam�, Brussels". Note that the 5th one is writted in cyrilic alphabet. 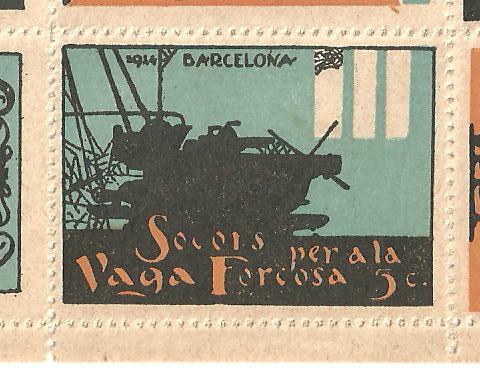 In 1914 there was a printer's lock-out in Barcelona. The reason is unknown to me; but, in the years before the wellfare state, that meant missery for the families of the printing workers. 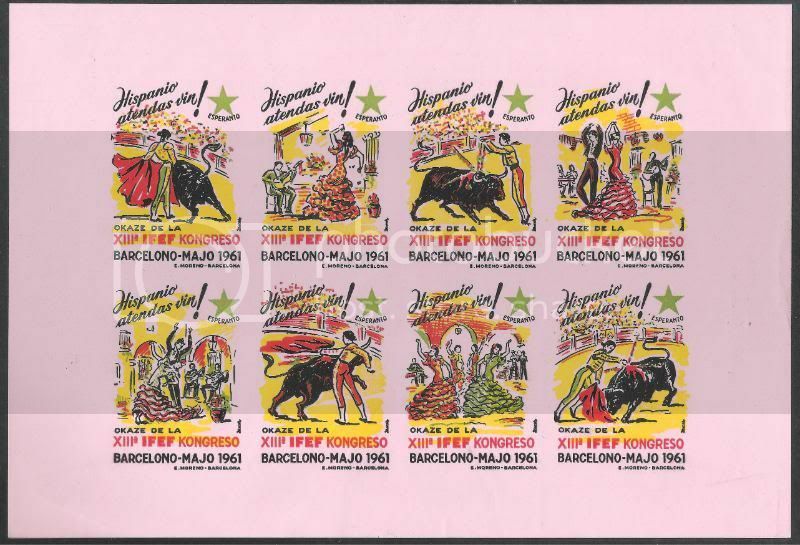 To help them, some of the Barcelona's artists drawn 20 cinderellas to be sold for the benefit of the printers. Each cinderella had a face value of 5 cents of pesseta (our currency between 1868 and 2001) and went on sheets of 20 different items. So, a sheet sold for 1 pesseta. In these days, printing was equal to people's education and culture. The sheet looks superb. Never seen it before. There seem to be a lot of nice Barcelona Cinderellas around, from Expostions or not. I'll post a few later if I can find some. Thank you very much for your nice comments. One thing that I like the most on our cinderellas is the way how they reflect the state on the art in Barcelona. 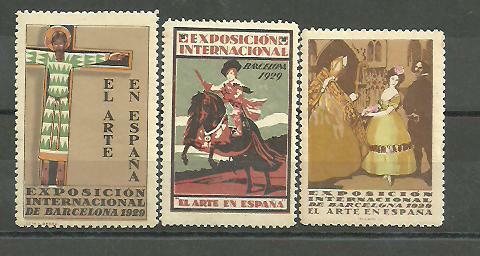 So in my albums I have from Art Nouveau cinderellas to the 1992 games mascot from Xavier Mariscal ones. In addition to the information supplied for the sheet; is that it mesures 200 mm(wide) x 220 mm (hight), being each cinderella 38x53 mm. Just to put things in propportion. I found one too ! Off course I have the statue cinderella. It shows la Dama d'Elx, an Iberic priestess sculpture. 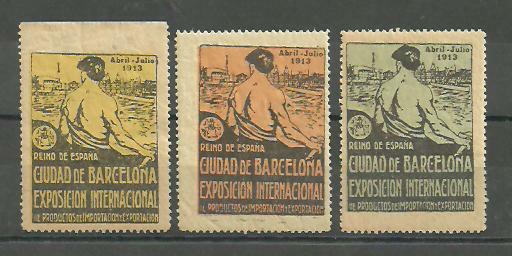 It was issued together with three other for the exhibition "El Arte en Espa�a", held during the 1929 Barcelona International Exhibition. As for the other cinderellas I don't have them as they show bullfithing, which I (like most Catalans) hate. Under the Animal Protection Act, passed by the Catalan Parliment in June 2010, bullfithing will be banned from Catalonia starting January 1st 2012. Cursus, you are a walking Barcelona Cinderellas encyclopedia! Please tell us more & post more scans if you can. I Liked MUCH what you & others have posted! I don't have them as they show bullfithing, which I (like most Catalans) hate. be carefull not to replace one horrible thing with another. 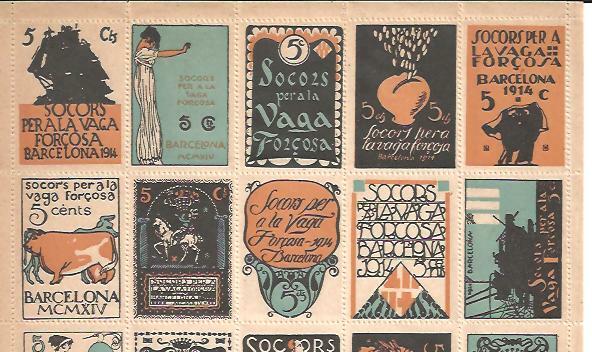 They're what we call "catalanist stamps", issued by the "Uni� Catalanista" to rise funds to support its activity in favour of the Catalan Culture, in the years around 1900. Being the work of the most known Catalan artists of the time, they depict Saint George (Patron of Catalonia, as well as of England, Greece, Egypt and many other countries), the design changed every year and the colour monthly. The idea was to affix on a cartoon to show that you've paid for your monthly contribution. 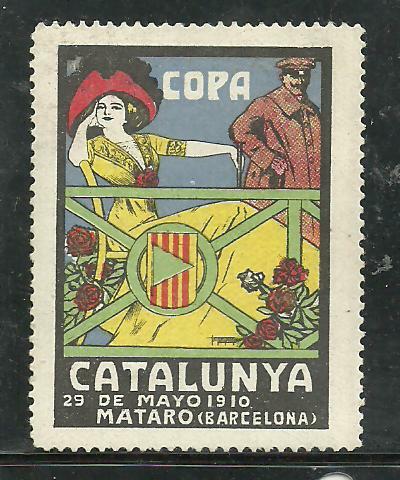 Furthermore, Catalans were encouraged to use them on their letters and postcards (in addition to the official Spanish stamps)to show their love for our country. 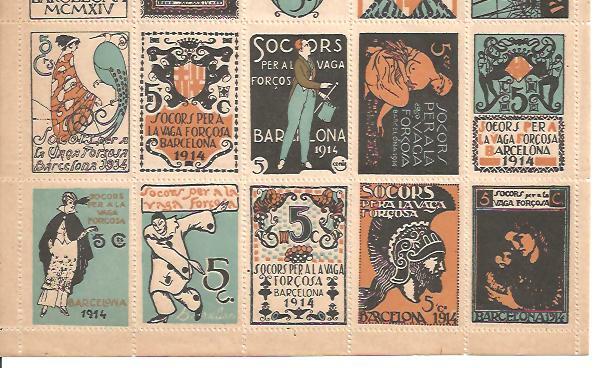 The Spanish authorities considered them "seditious" and, as they could do nothing to stop the issue, they instructed the Post Office men, to tear them off the letters and cards, whenever they found them. 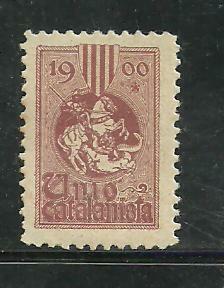 So, these catalanists stamps are quite common mint but very scarce on cover or card. Anyway, I'm not an expert on the subject, just know the basic facts. Based on a painting of Ramon Casas, it commemorates the 50th anniverssary of the recovery of the "Jocs Florals" in 1858, that despite what its name may seem (flor=flower) has nothing to do with botanics but with poetry. Born in Provence in the XIII century and adopted in Catalonia in the XIV, were revived by mid XIX century. The reason of the name is that prices were precious metal flowers. 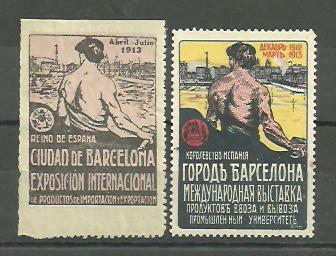 These contests had a tremendous impact in the culture and social live of Catalonia. Believe or not, winners poets were very popular. This other one is from one of the first car races that took place in Catalonia, this time in Matar� (30 km North/east of Barcelona). I like the expression of the lady and the very serious face of the "chaufeur" behind her. To end this post, a very sportive one. 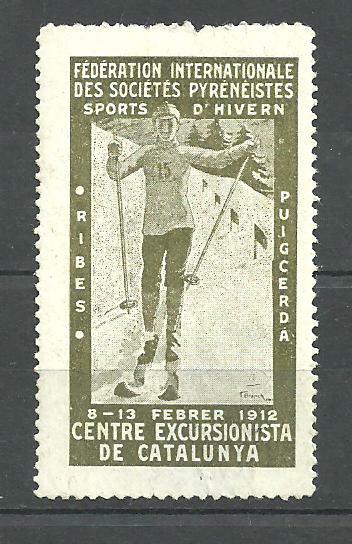 This one was issued in 1911 by the Centre Excursionista de Catalunya (Catalonia Treking Club, founded in 1876)to advertise an sky competition to be held in Ribes de Freser and Puigcerd� (on the Pyrenees, 150 km north of Barcelona). I like it because of the design and also because beign myself member of the club it remind me of our great-grand fathers. Although I only have this cinderella, there are, at least two more, as I know. Nice Cursus !! Here are some civil war locals I have not seen posted yet..anyone got 6 pence ??? 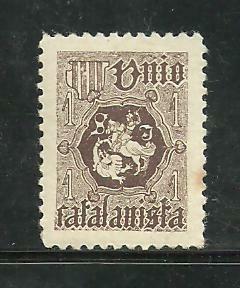 Bartomeu Robert I Yarz�bal:b. Tampico, Mexico, 1842 - d. Barcelona, 1902. Physician and politician. Grandson and son of physicians who had emigrated to Mexico, where Bartomeu was born and spent the early years of his childhood. He graduated in medicine in Barcelona (1863), and received his doctorate in Madrid (1866). He enjoyed great prestige for his diagnoses. An altruist, he often made visits free of charge, and distinguished himself particularly in the Barcelona epidemics of yellow fever (1870) and cholera (1885). Devoted to anthropological matters, he held several conferences, among them the controversy on The Catalan Race (1899) at the Ateneu Barcelon�s (Barcelona Athenaeum). He presided over that entity in 1881-82 and in 1900-01, as well as the Societat d'Amics del Pa�s (Compatriot's Society. 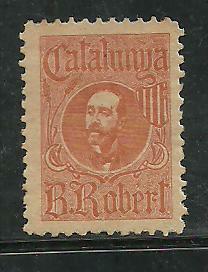 By March 1899 he was appointed mayor of Barcelona From that position, he attempted to introduce a restructuring of the personnel and carried out a purification of the electoral census; as a result of the formation and the aggravation of the conflict called Tancament de Caixes (Closing of business in protest against taxes) he found himself obliged to respect the government with the signing of a few decrees authorizing seizure of bad debtors and resigned in mid-October, a fact that gave him great popularity. 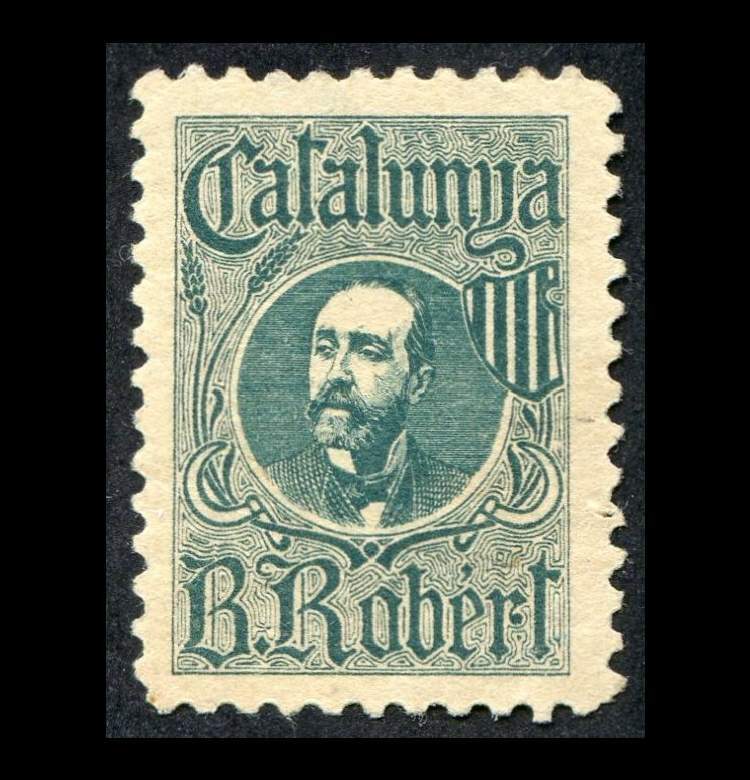 Upon the formation of the Lliga Regionalista (Regionalist League) in 1901, he proceeded to preside over it and, in the parliamentary elections of that year, was elected member of parliament for Barcelona by the Catalanist candidature. At his death, his popularity was such that the erection of a monument dedicated to him was undertaken in Barcelona. Commissioned to Llu�s Dom�nech I Montaner and of Josep Llimona, he created one of the main sculptural groups of the latter (1904-10), to whom the total paternity of the monument has been attributed, even though the hand of Antoni Gaud� has been pointed out in the architectural line, which is clearly Gaudian. Dismantled in 1940, its restitution was the motif of citizen campaigns and it was finally completed in 1985. 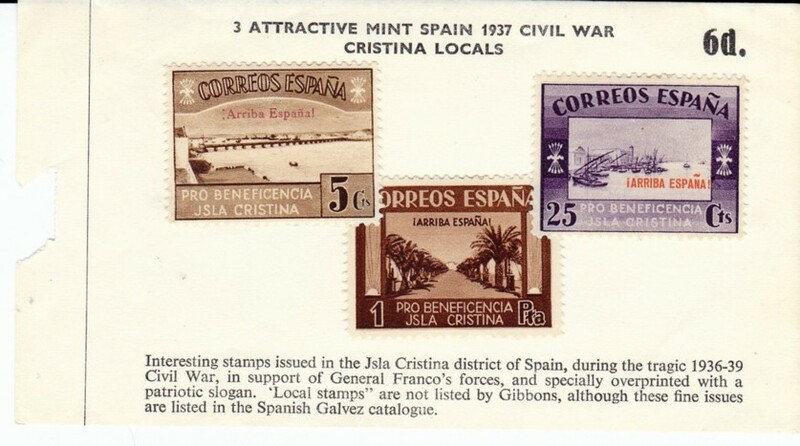 As for Phil, the nice Spanish civil war Isla Cristina (south of Spain) stamps that he's showing, have nothing to do with this thread. info purloined for my database.